19/09/2013 · I have SELECT privilege granted to me on some tables, which i found through user_tab_privs view. Now, I have written a stored procedure which is trying to insert into a table I have created with data from a query based on joins on the tables I have SELECT privilege on.... I have a problem writing stored procedures in Oracle. I am using SQL*Plus to write. 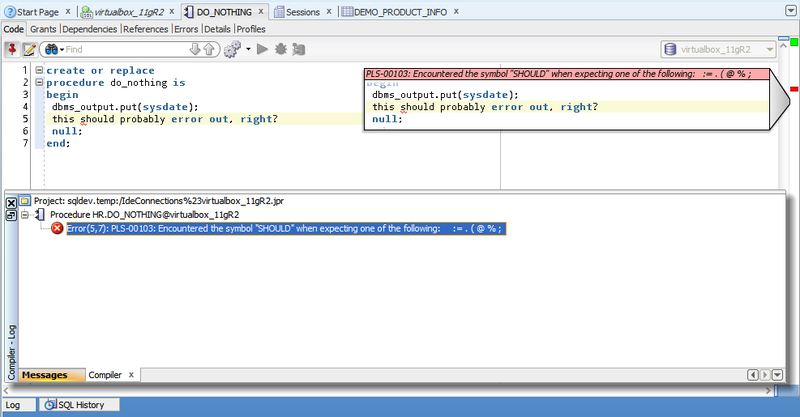 I typed ED at SQL prompt and entered the following in my procedure.. I am using SQL*Plus to write. I typed ED at SQL prompt and entered the following in my procedure..
ALTER PROCEDURE . Purpose. Use the ALTER PROCEDURE statement to explicitly recompile a standalone stored procedure. Explicit recompilation eliminates the need for implicit run-time recompilation and prevents associated run-time compilation errors and performance overhead.... ALTER PROCEDURE . Purpose. Use the ALTER PROCEDURE statement to explicitly recompile a standalone stored procedure. Explicit recompilation eliminates the need for implicit run-time recompilation and prevents associated run-time compilation errors and performance overhead. To see any errors from the compilation of the procedure use the show errors command. To run the stored procedures, use the EXECUTE command followed by the name of the procedure and any parameters. For example, to add 10 units of product P500 to location 106, execute the following:... ALTER PROCEDURE. The ALTER PROCEDURE statement recompiles a standalone stored procedure. Explicit recompilation eliminates the need for implicit runtime recompilation and prevents associated runtime compilation errors and performance overhead. Ask TOM "usage of procedure/function in create view/derive..."
19/09/2013 · I have SELECT privilege granted to me on some tables, which i found through user_tab_privs view. Now, I have written a stored procedure which is trying to insert into a table I have created with data from a query based on joins on the tables I have SELECT privilege on. I want to see a stored procedure definition which is inside the body of a package and the package is wrapped.So I am not able to see the content of the package body.I am new to oracle and I don't know how to decrypt the wrapped package.how to read the content of a wrapped package inside oracle. Tom, I tried to understand what's happening in here: I use one dynamic script to recompile all invalid pkg/fn/procedure under one dba account, and interesting thing is, one of procedure in schema1 turned to invalid after same name of procedure in schema2 didn't recompiled successfully due to less privilege on common tables in schema3. If I compile a stored procedure, other stored procedures which call this sp will becomes invalid. I need to recompile the others too. Is there a table which stores the dependency of sp? Thanks. I need to recompile the others too.